Background: Due to depletion of fossil fuel reserves, global warming, and the need for energy efficiency, the new energy resource is required. For this purpose, hydrogen can be considered as clean and efficient energy carrier. In this study, biohydrogen production from physical pretreated mixed culture was investigated. Materials and Methods: In this study, the optimal conditions for physical pretreatment of mixed culture were investigated for the enrichment of hydrogen-producing bacteria (HPB). 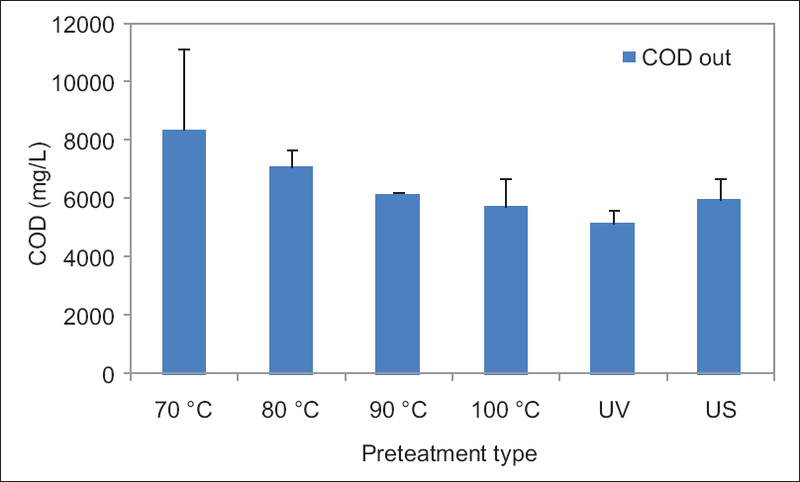 Three individual pretreatment processes, including thermal, ultraviolet (UV) radiation, and ultrasonication (US) were conducted in batch tests. The batch tests were carried out via 500 mL glass flasks with working volume 400 mL. Glucose was used as sole substrate, and other essential nutrient and trace elements were added. To agitation of substrate with HPB inoculum, the magnet stirrer was used at 60 rpm. Results: The results showed the production of H2gas could be increased by appropriate pretreatment methods including thermal pretreatment at 100°C. At 100°C as a pretreatment, the volume of H2gas was 112.25 mL and followed by US (97.46 mL), UV (89.11 mL), 80°C (72.72 mL), 90°C (53.95 mL), and 70°C (26.01 mL). In the pretreatment methods, the solution pH and effluent soluble chemical oxygen demand was 6.3–6.7 and 5100–8300 mg/L, respectively. Conclusions: The Gompertz model depicts that all R2 values were more than 0.93, indicating that the fitted curves were best fitted with the experimental points. According to U.S. Energy Information Administration reports, the total global energy consumption was in the range of 515–530 EJ (exajoules, 1018 J) in 2008 and it shows an ascending trend. High amount of the energy is produced from fossil fuels that results in the production of CO2 emissions (which are associated with climate change). In addition, fossil fuels are diminishing  and it was estimated that energy requirements increase too due to population growth. Production of the energy carriers from biomass has favored because biomass is available locally as well as its conversion into biological energy carriers is feasible without high capital investments. Using biomass as energy resources may reduce greenhouse gas emissions, environment-friendly, and create new jobs. For example, methane (biogas) has been produced at full scale through anaerobic digestion for decades. Biologically-produced methane can be combusted for heat and/or electricity or it can be upgraded to use as vehicle fuels or fed to the gas network. H2 has the highest gravimetric energy density (122 kJ/g) in comparison with other fuels. Recently, international support for developing these relatively new sources of energy has been increased due to their benefits. One such benefit is the reduction in greenhouse gas emissions. In past, hydrogen is at the moment produced by reforming, pyrolysis, biomass gasification, or electrolysis. Biological hydrogen production from organic matter is considered one of the most promising alternatives for sustainable green energy production. Dark fermentative hydrogen production is a process which anaerobic bacteria use organic compounds to produce hydrogen in the absence of a light source. It is known that H2 accumulate if the methanogenesis step is inhibited. In waste treatment applications, biohydrogen production will likely come from mixed-culture systems rather than pure cultures. Mixed cultures allow bioprocessing of organic material in nonsterile environments and offer a greater ability to use mixed substrates due to higher microbial diversity. Mixed culture systems are easier, less expensive to operate, and allow more continuous processing.,, However, application of mixed culture needs to enrichment method of hydrogen-producing bacteria (HPB) and called pretreatment methods. The seed pretreatment methods can affect both the start-up and overall efficiency of the hydrogen-producing reactors. In the literature, many different methods were suggested some methods for enriching HPB from mixed culture mainly include heat-shock, load-shock, acid, base, 2-bromoethanesulfonate acid (BESA).,, There are many inconsistencies about optimum treatment method. Therefore, the aim of this study was to investigate the effects physical pretreatment methods on mixed culture (anaerobic sludge) to enhance fermentative H2 production from glucose. In addition, kinetic analysis was carried out to demonstrate hydrogen production behavior. In this study, anaerobic digested sludge was used as mixed culture source. Anaerobic sludge was obtained from an anaerobic sludge digester unit of the South Municipal Wastewater Treatment Plant (Tehran, Iran). To remove large particle and debris, the parent sludge was sieved with standard mesh No. 16. The pH, volatile suspended solids, and total suspended solids concentrations of raw sludge were 7.75 ± 0.1, 16.84 ± 3.4, and 32.56 ± 6.58 g/L, respectively. Prior to use, the sludge was subjected to thermal (70, 80, 90, and 100°C), ultraviolet (UV) radiation, and ultrasonic pretreatment methods to enrich H2 producing bacteria. In the thermal pretreatment, the seed sludge was heated at 70°C, 80°C, 90°C, 100°C for 30 min with a hotplate while mixing at 1200 rpm. For ultrasonic and ultraviolet pretreatment, anaerobic sludge was encountered to UV radiation UV lamp (150 W high pressure) for 20 min and ultrasonication (US) wave (150 W, 20 kHz) for 20 min. All batch experiments were conducted in stirred glass flasks (360 s idle and 30 s mixing at 60 rpm) with a total volume of 500 mL and working volume of 400 mL. The flasks were filled with 200 mL of pretreated anaerobic sludge and 200 mL of substrate and leaving 100 mL of headspace for gas accumulation. Glucose was used as a sole substrate at 4 g/L. Inorganic nutrients (NH4 Cl, 76.45 mg/g chemical oxygen demand [COD] and KH2 PO4, 10.00 mg/g COD); trace elements as COD as mg/g (K2 HPO4, 25.32; FeCl3, 1.021; CaCl2.2H2O, 2.06; MgSO4.7H2O, 2.14; MnCl2.2H2O, 0.34; CoCl2.6H2O, 0.092; NiSO4.6H2O, 0.0763; ZnSO4, 0.0592; Na2 MoO4.2H2O, 0.0822; CuCl2.2H2O, 0.016; H3 BO3, 0.020), yeast extract (36 mg/L), peptone (36 mg/L) were also added. The deionized water was used as initial medium, and all chemical have analytical grade and purchased from Merck Co. All batch experiments were performed in triplicate and average values are reported. The volume of biogas produced was measured by liquid displacement technique. All batch tests were conducted in a water bath at 37°C ± 0.2 without external buffer addition. The solution pH and soluble COD (sCOD) were measured using a glass body pH probe (CG 824 SCHOTT), closed reflux colorimetric method. All test methods were obtained from “Standard Methods for the Examination of Water and Wastewater." The percentage of H2 in the headspace was determined by a hydrogen analyzer (COSMOS-XP-3140 model, Japan). The average hydrogen production rate (RH2) was computed by Equation 2.
where Ht is cumulative hydrogen production as a function of time (mL), Hmax is maximum hydrogen production potential (mL), Rmax is the maximum rate of hydrogen production (mL/h), and λ is the lag phase (h) or the time to exponential hydrogen production. 100°C > US > UV > 80°C > 90°C > 70°C. 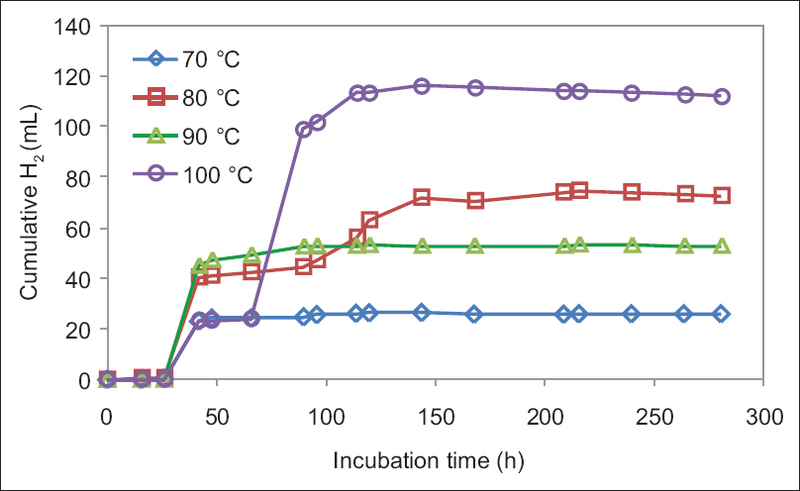 [Figure 2] demonstrates the development of cumulative hydrogen volume with the incubation time with thermal pretreatment. As shown in [Figure 2], during hydrogen fermentation process, hydrogen production has begun immediately after a short lag period and then the hydrogen exponential produced. Significant hydrogen production was not observed during the initial period for thermal treatment. After this time, hydrogen production was started and depicts activation of HPB. The hydrogen production was terminated after around 144 h incubation period. 70°C (6.68) > UV (6.54) > US (6.5) > 90°C (6.54) > 80°C (6.39) > 100°C (6.34). At the beginning step of BHPT, the pH of mixture of pretreated inoculum and feed substrate was 7.5 and then decline to the mentioned level. [Figure 4] shows the effluent sCOD of BHPT after incubation time. As illustrated in [Figure 4], the highest and lowest sCOD was measured 70°C and US treatment, respectively. At the end of BHPT, the amount of effluent sCOD was 70°C, 80°C, 90°C, US, 100°C, and UV. The accumulative hydrogen production data from different thermal treatment was fitted with modified Gompertz equation [Equation 1]. According to [Figure 5], cumulative hydrogen production curve has been best fitted by maximizing the determination coefficient using trials and error procedure. At first, parameter values were estimated by eye and were subjected to the constraints of Hmax (mL), Rmax (mL/h), and λ (h). The hydrogen production characteristics are shown in [Table 1]. The kinetic models were extensively used in order to determine the optimal operating conditions, process design as well as anaerobic hydrogen-producing processes control. According to the results in [Table 1], all R2 values were more than 0.93. However, these results present that data obtained from the experiments have properly matched with the experimental points and suggesting the modified Gompertz model was able to adequately describe the hydrogen production from thermal pretreated mixed cultures using glucose as sole substrate. 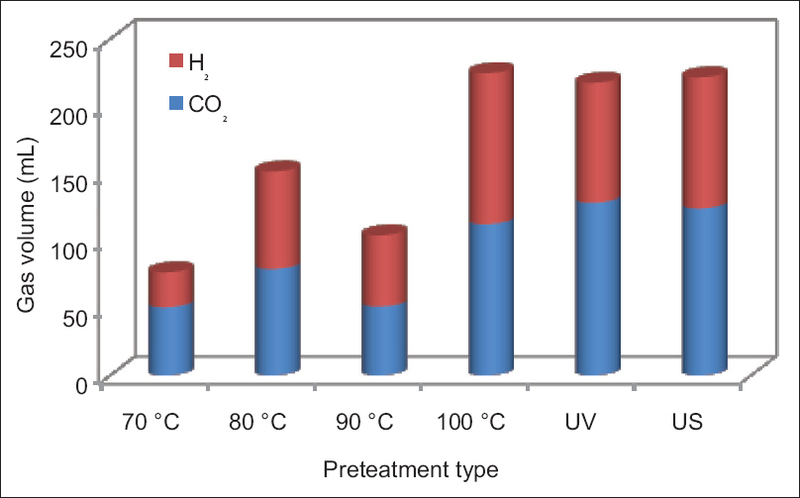 The better performance of hydrogen production behavior under 70°C and 90°C pretreatment than 90°C and 100°C pretreatment may be concluded from the kinetic analysis [Figure 5]. At higher lag phase time; pretreatment at 100°C resulted in a large amount of hydrogen emission than other thermal treatment and described the significant effect of them on the maximum hydrogen production rate (Rmax). In 70°C, 8°C, and 90°C pretreatment, the Rmax values were largely lower than obtained value at 100°C. 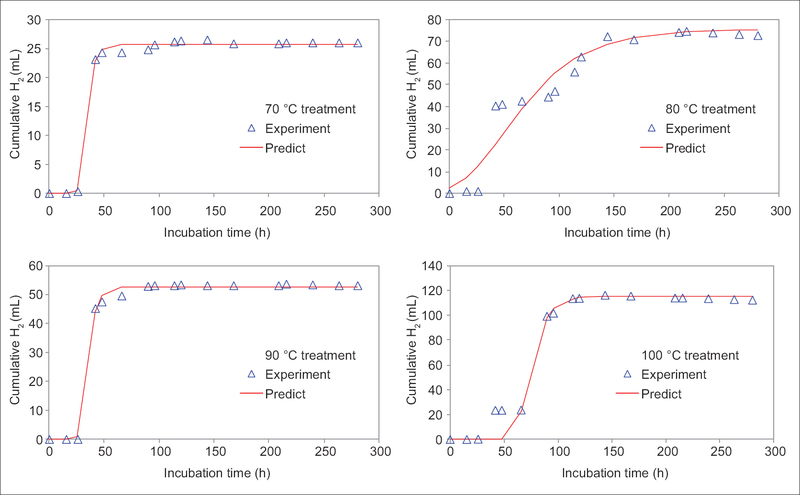 The higher lag phase for 100°C pretreatment presumably relates to need a long time for adaptation and new condition and enzyme production for glucose fermentation. As previously stated, pH level has an effect on the enzyme activity in microorganisms, since each enzyme is active only in a specific pH and has the maximum activity at optimum pH. It has been accepted in hydrogen research that pH is one of the key factors for the hydrogen production. Hydrogen fermentation pathways are sensitive to pH and influence on the end-products  It has been reported that operating under optimum pH lead to this fact that the hydrogen fermentation process has shifted to solvent production  or prolonged the lag phase. The lactate production was always observed together with the sudden change of environment parameters, such as pH, HRT, and temperature, which indicated the culture was not adapted to the new environment conditions., In this research, it has been found the optimal pH is around 5.0–5.5 and confirmed the previous reports.,, Decreasing pH is related to the high accumulation of volatile fatty acids during glucose fermentation. The sCOD of influent substrate was 3750 mg/L, and the higher sCOD of effluent presumably related to release sugars during treatment method and some of the produced biogas may be attributed to release sugars. Base on the results obtained, the digested sludge from a wastewater treatment plant can be used as hydrogen production culture a by using various pretreatment method and the pretreatment surely increased the hydrogen production. Thermal pretreatment at 100°C was effective at generating hydrogen producing seeds. The results showed that the modified Gompertz equation well described the kinetics of the hydrogen production from glucose by using pretreated mixed culture. Hmax, Rmax, and the maximum RH2 were 115.09 mL, 4.08 mL/h, and 1.3 mL/h, respectively, at 100°C pretreatment. The Gompertz model depicts that all R 2 values were more than 0.93, indicating that the fitted curves were best fitted with the experimental points. We gratefully acknowledge Dr. Karim Ebrahim for his assistance in VFAs and alcohol analysis. This research was financially supported by Isfahan University of Medical Sciences under Grant Nos. 394341 and 393298. There are no confl icts of interest. (EIA) USEIA. International Energy Outlook 2011. Internet Document; 2011. Available from: http://www.eiagov/ieo/pdf/0484(2011) pdf. [Last accessed on 2011 Feb 21]. IPCC. IPCC Special Report on Renewable Energy Sources and Climate Change Mitigation. Special Report of the Intergovernmental Panel on Climate Change. Internet Document; 2011. Available from: http://www.srrenipcc-wg3de/report/IPCC_SRREN_Full_Reportpdf. [Last accessed on 2012 Jun 12]. Hoogwijk M, Faaij A, Broek RV, Berndes G, Gielen D, Turkenburg W. Exploration of the ranges of the global potential of biomass for energy. Biomass Bioenergy 2003;25:119-3. Antoni D, Zverlov VV, Schwarz WH. Biofuels from microbes. Appl Microbiol Biotechnol 2007;77:23-35. Wang YY, Ai P, Hu CX, Zhang YL. Effects of various pretreatment methods of anaerobic mixed microflora on biohydrogen production and the fermentation pathway of glucose. Int J Hydrogen Energy 2011;36:390-6. Holladay JD, Hu J, King DL, Wang Y. An overview of hydrogen production technologies. Catal Today 2009;139:244-60. Zhu H, Beland M. Evaluation of alternative methods of preparing hydrogen producing seeds from digested wastewater sludge. Int J Hydrogen Energy 2006;31:1980-8. Fernandez FJ, Villasenor J, Infantes D. Kinetic and stoichiometric modelling of acidogenic fermentation of glucose and fructose. Biomass Bioenergy 2011;35:3877-83. Kleerebezem R, van Loosdrecht MC. Mixed culture biotechnology for bioenergy production. Curr Opin Biotechnol 2007;18:207-12. Lee HS, Krajmalinik-Brown R, Zhang H, Rittmann BE. An electron-flow model can predict complex redox reactions in mixed-culture fermentative bioH2: Microbial ecology evidence. Biotechnol Bioeng 2009;104:687-97. Thong SO, Prasertsan P, Birkeland NK. Evaluation of methods for preparing hydrogen-producing seed inocula under thermophilic condition by process performance and microbial community analysis. Bioresour Technol 2009;100:909-18. 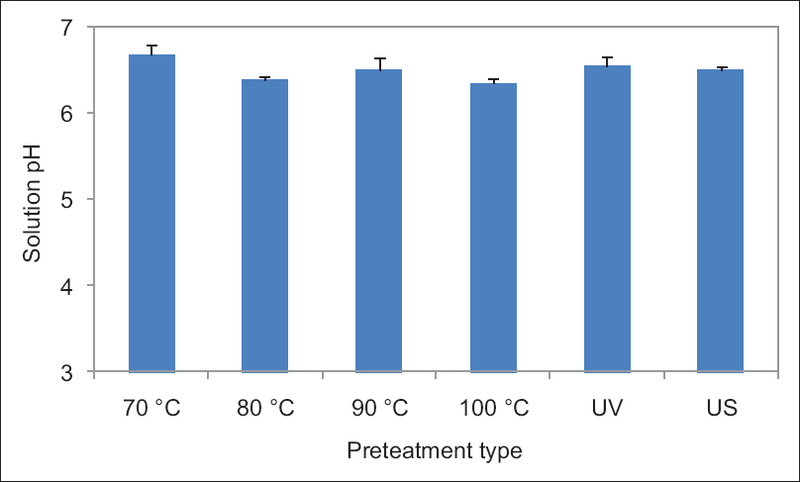 Zhang K, Ren N, Guo C, Wang A, Cao G. Effects of various pretreatment methods on mixed microflora to enhance biohydrogen production from corn stover hydrolysate. J Environ Sci (China) 2011;23:1929-36. American Public Health Association, Water Environment Federation. Standard Methods for the Examination of Water and Wastewater. 21st ed. Washington, DC: American Public Health Association, American Water Works Association, WPCF; 2005. Ginkel SV, Sung S, Lay JJ. Biohydrogen production as a function of pH and substrate concentration. Environ Sci Technol 2001;35:4726-30. Gou C, Guo J, Lian J, Guo Y, Jiang Z, Yue L, et al. Characteristics and kinetics of biohydrogen production with Ni 2+ using hydrogen-producing bacteria. Int J Hydrogen Energy 2015;40:161-7. Chang S, Li JZ, Liu F. Evaluation of different pretreatment methods for preparing hydrogen-producing seed inocula from waste activated sludge. Renewable Energy 2011;36:1517-22. Chaganti SR, Kim DH, Lalman JA. Dark fermentative hydrogen production by mixed anaerobic cultures: Effect of inoculum treatment methods on hydrogen yield. Renewable Energy 2012;48:117-21. Lay JJ, Li YY, Noike T. Influences of pH and moisture content on the methane production in high-solids sludge digestion. Water Res 1997;31:1518-24. Craven SE. Increased sporulation of clostridium-perfringens in a medium prepared with the prereduced anaerobically sterilized technique or with carbon-dioxide or carbonate. J Food Prot 1988;51:700-6. Temudo MF, Kleerebezem R, van Loosdrecht M. Influence of the pH on (open) mixed culture fermentation of glucose: A chemostat study. Biotechnol Bioeng 2007;98:69-79. Cheng SS, Chang SM, Chen ST. Effects of volatile fatty acids on a thermophilic anaerobic hydrogen fermentation process degrading peptone. Water Sci Technol 2002;46:209-14. Demirel B, Yenigun O. Anaerobic acidogenesis of dairy wastewater: The effects of variations in hydraulic retention time with no pH control. J Chem Technol Biotechnol 2004;79:755-60. Liu D, Liu D, Zeng RJ, Angelidaki I. Hydrogen and methane production from household solid waste in the two-stage fermentation process. Water Res 2006;40:2230-6. Alzate-Gaviria LM, Sebastian PL, Perez-Hernandez A, Eapen D. Comparison of two anaerobic systems for hydrogen production from the organic fraction of municipal solid waste and synthetic wastewater. Int J Hydrogen Energy 2007;32:3141-6. Gomez X, Moran A, Cuetos MJ, Sanchez ME. The production of hydrogen by dark fermentation of municipal solid wastes and slaughterhouse waste: A twophase process. J Power Sources 2006;157:727-32.